A piece of Boeing 777 discovered on an Indian Ocean beach can only be the missing flight, but it’s 4,500 miles from where it was predicted to wash up. 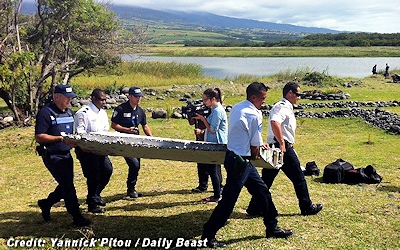 A U.S. official tells the Associated Press that part of an airplane found washed up on a beach on the Indian Ocean island of Rénunion is from a Boeing 777. Only one Boeing 777 has ever disappeared over water: Malaysia Airlines Flight 370. After a fruitless 17-month search this could be the beginning of solving the world’s greatest aviation mystery—the first piece of physical evidence that investigators can examine. The piece of debris is part of a wing and probably a control surface from that wing. Control surfaces are among the most likely part of airplane wreckage to survive for a long while as flotsam. . . .